While an air freshener that only releases its smell when you get a mention on social media sites can seem cool, perhaps you want something a little more straightforward to keep in you control, without having to reach for your cellphone, or computer, or even get out of your chair. 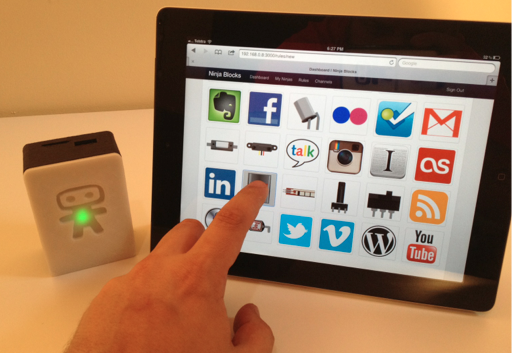 Ninja Blocks is a home-automation gadget of sorts that lets household items connect to the internet and to online services. It can carry out certain tasks around the house, or it can serve as a notification system for your Web apps. To do this, it uses to an online service, called Ninja Cloud, inorder to "talk" to websites and Web apps. Take a picture of your front yard and save it to Dropbox when movement is detected. In this example, the detected movement would be the "trigger", and photo saved to Dropbox would be the "action". The project creators hope to get a bit of funding on Kickstarter so they can start producing the hardware. Ninja Blocks will only support actions with Dropbox, Twitter, Facebook, Google Docs, SMS, and Xbox Live at first, but the creators plan to add in support for other services later on. Still, if you want to be on the waiting list for the first batch of Ninja Blocks, consider pledging at least $155 to the cause--if you just want to check out Ninja Cloud, the project has a (cheaper) reward for that too. Find out more about Ninja Block on Kickstarter, or visit the development blog.